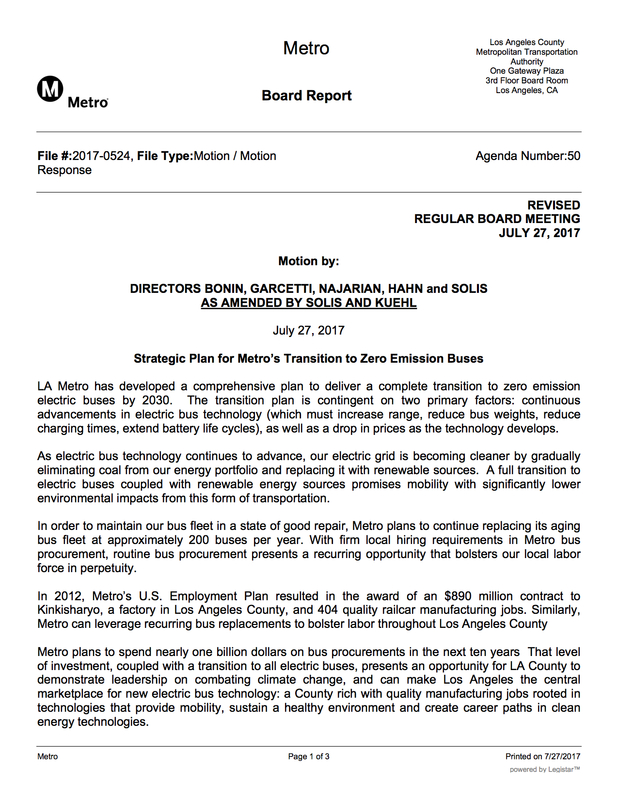 Attentive Source readers know that the Metro Board has adopted a policy of converting Metro’s entire fleet of buses to zero emission vehicles by 2030. The bus fleet is currently powered entirely by compressed natural gas, which burns much cleaner than the diesel fuel which previously fueled the fleet. A fully electric fleet is mighty ambitious considering Metro has the second largest bus fleet in the U.S. (about 2,200 buses) and the rigorous demands Metro puts on its bus fleet — with vehicles in operation for many hours a day, day after day. •A contract was approved to purchase 60 40-foot zero emission buses from BYD to be used on the Silver Line. Staff report. •A contract was approved to purchase 35 60-foot articulated zero emission buses from New Flyer to be used on the Orange Line. Staff report. 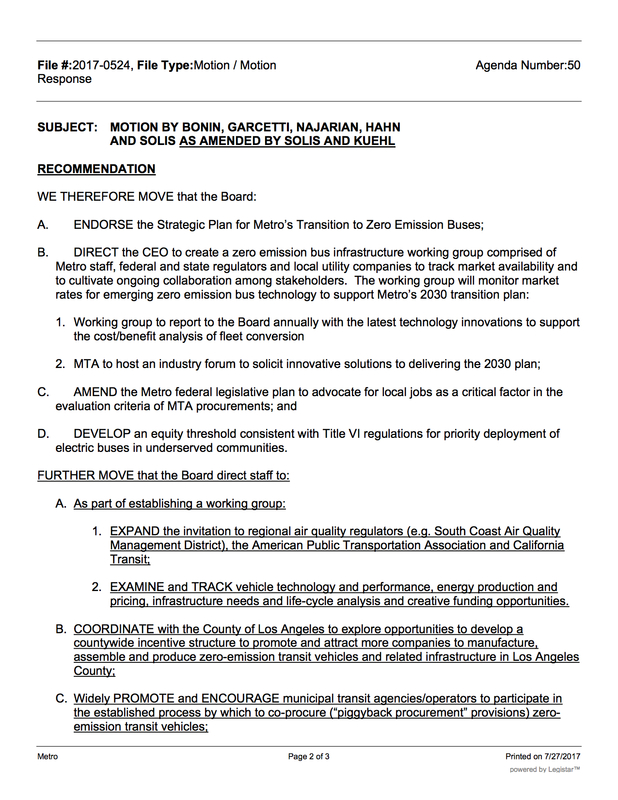 The vote was 7 to 3; attached was a motion calling for Metro to negotiate a local hire program with New Flyer. This was a contentious item, wit Board Members Janice Hahn, Ara Najarian and Hilda Solis supporting a motion calling for giving the contract to BYD. Staff and Board Members supporting New Flyer argued that firm’s technical merits were stronger. •A contract was approved to purchase 65 60-foot CNG buses from New Flyer to replace buses purchased between 2004 and 2008 and go into service between 2018 and 2022. Staff report. The Metro Board last month also approved a contract to purchase 295 40-foot CNG buses from El Dorado. Staff report. •A contract was approved worth up to $26.5 million with Cummins Engines for up to 395 ‘near zero emission’ CNG engines for existing buses. Staff report. The challenge for Metro is finding electric buses that can meet the agency’s operational needs on its local and rapid lines. Those type of buses should be available — but probably not until the 2020 to 2022 timeframe. So we’re probably a couple of years away from the agency making a decision on how best to electrify the full fleet. In the meantime, the agency has to accommodate 900,000-plus boardings on its buses on the average weekday, one reason the agency has to be careful about abandoning the compressed natural gas technology that has proven to work. In the near-term, Metro is working toward using only electric buses on the Orange Line by 2020 and the Silver Line by about 2021 or possibly earlier; the thinking is that electric buses will be easier to implement first on the bus rapid transit lines. The agency is also converting many of its CNG buses to near-zero CNG that have extremely low nitrogen oxide emissions — a key ingredient of smog. As I wrote last month, this seems to be a pretty good path forward — maintaining the service that tens of thousands of Metro riders rely upon while beginning to transition the fleet to zero emission. Transportation sources are responsible for about 22 to 28 percent of our region’s smog. The chart shows smog from different transpo sources. Source: South Coast Air Quality Management District. I also want to repeat a salient fact: there are more than eight million registered vehicles in L.A. County. 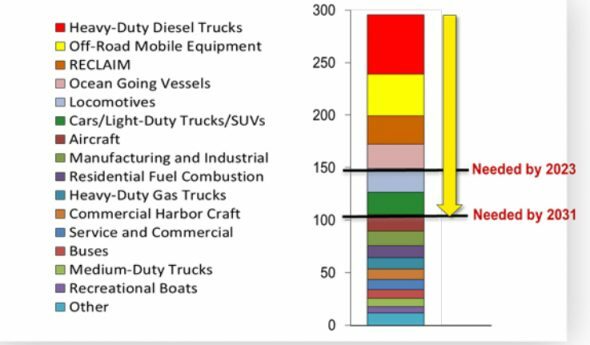 Transportation sources contribute about 22 percent to 28 percent of the emissions that contribute to smog in our region (see chart at right). It is going to take a lot more than Metro electrifying its bus fleet to improve our air quality, although I think Metro absolutely has a role to play — and it’s good to see the agency taking a leadership role as electric buses are the future. What makes the MTA believe efficient electric buses will be available in three years? The hybrids from Nabi are sitting at Division 12 awaiting sale after only being used for a couple of years and the electric buses from New Flyer were returned not to long after delivery. To many decisions are made at the MTA that lack a key component, operations. These pie in the sky ideas must include the knowledge of how the system operates. Time constraints at terminals, current terminal operation and design. The latter from my own experience has been lacking when terminals were replaced or rebuilt. As it stands right now one could for see many break downs on the Silver Line along both the Harbor Freeway and the San Bernadino Busway as well as the Orange Line. When reaching the lines terminal the primary issue on the bus operators mind will not be plugging a cable into the side of their bus. It will be getting to the restroom and purchasing lunch or a snack. And if an electric terminal is not available for some reason then that bus will be missing their scheduled charge. I don’t believe MTA passenger will be happy observing buses scheduled out of the terminals sitting at recharging locations receiving their minimal charge in order to continue in service. Until the technology is perfected the idea of electric buses in Los Angeles must be put on hold. It might work some places but the MTA’s experience has been a failure. The electric buses were actually from BYD, not New Flyer. I agree, if buses are going to have to be sitting at recharging stations they many not be able to be on schedule. Plus what happens if the bus runs out of power in the express toll lanes on the two freeways? Metro may have to put back in the overhead electrical wires like buses had decades ago. Even though they are ugly at least the buses won’t need to be recharged. Should work unless of course we have an electrical blackout. This means NewFlyer XN60s for the Orange Line, right? Why not purchase Trolley Buses for the Orange Line? It should be a fairly easy conversion on the Orange Line as it runs, almost, exclusively on a private right of way. These buses are here today and are NOT from a Chinese company. I beleve that these buses are made in Sweeden and might be a great fit for METRO. Trolleybuses for the USA market are primarily supplied by New Flyer. Seattle and Vancouver just renewed their fleer with both 40- and 60- (Articulated) footers. These buses, like many “American” cars, are initially constructed in Canada (Manitoba) and USA (Minnesota) and then would have final assembly in the City of Ontario, in San Bernardino County, California where New Flyer has an established facility. Canada is a country to the north of the USA which has been at peace with the USA, for the most part, since 1814. Of course, San Bernardino County is not Los Angeles County, which is why the Board of Directors gave some of today’s order to a company from Communist China, a country that earlier this month used its Air Force to harass US Military planes in international airspace. Is the Eldorado bus order still going through? Yes. That contract was approved at the June 22 meeting for 295 buses. Thanks for reminder: I should add that to this post. Here’s the meeting recap: https://media.metro.net/board/recap/2017/20170622_recap_rbm.pdf. The Orange and Silver Lines will need overhead contact wires with the purchase of a fleet consisting NewFlyer XT40s and XT60s because recharging will be an issue. Why is METRO awarding BYD a contract after that miserable failure of just 2 years ago? They have an assembly location in Lancaster which is in Los Angeles County. New Flyer’s assembly location is in the City of Ontario in San Bernardino County. Los Angeles County must avoid buying anything made in San Bernardino County as it may not employ persons residing in Los Angeles County. That is why Los Angeles County is sending money to a inexperienced Chinese company instead of a proven Canadian company. Really? They’re going to go with BYD?? They bought and tested 5 of these vehicles a while back and they failed. They returned them. Now, Metro gets to have yet another bus maker’s supplies to hunt after: Parts for the BYD buses, Parts for the coming El Dorado National buses, Parts for the 60-foot NABIs (which NewFlyer bought and will take care of), Parts for the 40-foot CNG NewFlyers, Parts for the 60-foot Electric NewFlyers. Metro could have easily transitioned to a fleet of buses with parts from the same manufacturer, but this makes things far more complex and interesting! Here we go again, more waste of taxpayers money. These buses, from BYD have already proved to be unreliable, now they’re wasting more money on those pieces of junk. Next they’ll ask the voters for more money or ask patrons for more money. This seems to be a never ending cycle. I say to the MTA, “stop wasting our money”, buy something usefull, for a change. Just one point on the priority of bus lines receiving electric buses – as someone has pointed out recently, the biggest advantage to electric vehicles is regenerative braking – which means that a local line would benefit far more than the Orange, Silver, or Rapid lines. Metro has NEVER learned any lessons from other cities and bus operators, for instance AC transit, in the bay area has mostly buses from Gilig. I don’t see why Metro keeps experimenting with differant bus manufactures instead of staying with one manufacturer. Just more waste of our dollars, and nobody seems to care about the continued waste of our taxpayer dollars.